1188 Meadow Knoll Lane is located in Meriwether Farms Subdivision in Clarksville TN and is close the the Interstate 1-24, shopping, schools and Fort Campbell. It is located approximately 20 minutes from Fort Campbell Military base, home of the 101st Airborne Division. The house is in a well established neighborhood and is very close to the TN and KY Border. Clarksville Mongomery County is surrounded by Christian, Todd and Cheatham county and has easy access to the interstate. Nashville TN is approximately 50 minutes away from this neighborhood and city. The house sits close to a cul-de sac, is a split level design and has 4 Bedrooms and 3 Bathrooms, a huge backyard and living room with a fireplace. There is an Eat in kitchen and a separate formal dining room with hardwood floors for those entertainment events and get togethers. The kitchen is spacious with a pantry and durable counter tops. All the appliances in the kitchen will remain with the house. The Master Bedroom has an attached bathroom with double vanities trey ceilings and a walk in closet. There is a huge finished rec room downstairs with a room and full bathroom. This home also has a nce backyard with a deck out back for those special family BBQ's. There are two additional bedrooms on the other side and a full bath in the hallway. With ample space for a big family, this home is ready to move into and is in great shape. 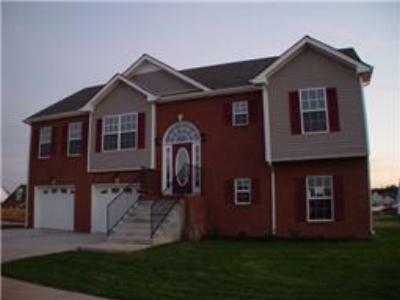 This neighborhood is close to Fort Campbell and to the main interstate along the TN and KY Border- I-24. With a perfect location, the home sits off Exit 1 and is 50 minutes away from Clarksville, 30 minutes away from Hopkinsville KY and 30 minutes away from Cadiz KY. We have Lake Barkley and KY Lakes close by. This area is expanding vastly and the city is the 9th fastest growing city in the nation. This is a very established neighborhood and has lots of mature trees. The Construction in this neighborhood originally started in 2005 and there are still some new homes being built at the back in the new section. There are some community parks and pools nearby. The closest community pool would be Swan lake sports complex where there are Tennis Courts and a park for the children's entertainment. Billy Dunlop park is also located just minutes away. The Mcgregor park is down by the river and is used for Riverfest and other events. The Great Escape Movie Theatre is about 2 miles away and mall and restaurants are also nearby. I am a Realtor licensed in Tennessee and Kentucky and I am the listing agent in this area. If you would like similar marketing on the properties in this neighborhood and need an assessment of the value of your home, please contact me for a free consultation at no obligation to you. I can be reached at (931) 206-0897.